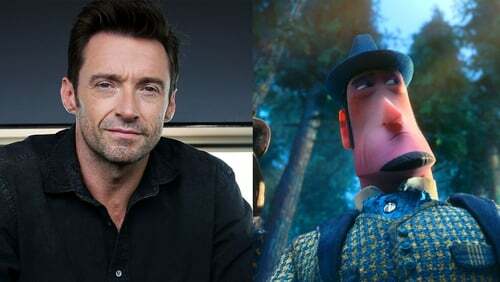 Chris Butler, the writer and director behind the new stop-motion animated adventure comedy Missing Link, has said that Australian actor Hugh Jackman brought something unexpected to the leading role in the film. Produced by stop-motion animation studio Laika, who are behind the acclaimed Coraline, ParaNorman, The Boxtrolls and Kubo and the Two Strings, Missing Link is a feelgood adventure which follows British intrepid explorer Sir Lionel Frost (Jackman) as he helps Mr Link (Zach Galifianakis), the legendary Bigfoot, find his long-lost relatives in the fabled valley of Shangri-La. Speaking to RTÉ Entertainment, Butler revealed that he wrote the central character Sir Lionel Frost with The Greatest Showman star in mind. "I was very much thinking of him", Butler said. "Even some of the initial sketches I did of the character were based on Hugh. You never know whether you’re going to get these people or not because they’re hugely busy, but I lucked out, he wanted to do it. "He called me and said he wanted to do it after reading the script, but it turned out that he was a fan of the Laika movies as well, so I think that really helped inform his decision to do it was he saw what we’d done in the past and how much time and love we put into our movies." The Liverpool-born filmmaker said Jackman brought something unexpected to his character "daily". "A lot of this movie is playing with stereotypes of classic adventure stories, and this idea of the suave British gent, this famous explorer, I wanted to have some fun with it and make him a little bit unexpected and I think what Hugh Jackman brought to the role really helped with that. "The character it pretty selfish but he’s got this giddy schoolboy enthusiasm that’s infectious and charming." Butler said he wrote the story for a number of reasons. "There’s a lot of elements to this story that I just love, that I’ve loved since I was a kid. I love the traditional adventure stories, I talk about this movie being a cross between Indiana Jones and Sherlock Holmes with monsters. That pretty much encompasses a lot of the stuff that I was into when I was a kid. "When you’re writing any movie, you want to have in mind something to say, there’s got to be a point to it. I very quickly understood that this was going to be a movie about friendship and identity, and how your identity is what you give yourself not what others put on you. "Once I had the theme and had these inspirations, it pretty much wrote itself." Chris Butler says Missing Link is about "friendship and identity"
As well as Jackman and Galifianakis, the star-studded cast also includes Zoe Saldana, Emma Thompson, Stephen Fry, David Walliams, Timothy Olyphant and Matt Lucas. "One of the joys of working with a cast like this is that for so long all of these characters have existed only in my head, then you put those pages in front of them and they take on a life of their own", Butler explained. "That’s the best part for me because it constantly takes me by surprise. For years I might have thought that a certain line should be shouted, and then Hugh or Zoe or Zach will whisper it and it gives it a whole other meaning. "Quite often when I was recording with these guys, I was rewriting lines as I was going along because I was inspired by some of the stuff that they were doing." The filmmaker said that casting The Hangover star Galifianakis as the loveable Mr Link was key to the film's success. "I knew there was something about Zach that would make Mr Link special. He’s the heart of the movie and I didn’t want him to be a goofy buffoon, it was about this vulnerable naive character who was stepping out into the world for the first time. "That’s what I like most about Zach’s comedy is that it has a shy awkwardness, a real vulnerability to him that’s very sweet, very warm. "The movie’s very much about empathy and a lot of that is on Zach’s shoulders." Butler said that casting Emma Thompson in a smaller but impactful role was "a real gift". "Her character appears at the end of the movie and it’s almost like a treat for the audience. She’s got such a majestic gravitas to her so I knew that I had to aim high for the voice casting there. I love that character. Who gets to cast Emma Thompson as a yeti?! It was brilliant." He added of Guardians of the Galaxy star Zoe Saldana: "And Zoe was a treat as well, she brought so much to Adelina that was unexpected and passionate. She was a delight to work with." Butler said that recording the voice parts can be "liberating" but "intimidating" for the actors. "More often than not on these movies you have an actor in a booth on their own with just a script in front of them and headphones on, and that’s it. It’s a very pure kind of acting really because it’s just them and their voices", he said. "I think they find it liberating in some ways because they don’t have to worry about how they look but in other ways I think it can be quite intimidating because there’s nothing else to lean on, there’s no props, no sets, it’s just them." Missing Link has been five years in the making, and Butler said it feels "surreal" to be finally releasing it into the world. "It’s surreal because it’s been in my head for so long and now it’s not, it belongs to everyone." And would he like to bring Sir Lionel Frost and Mr Link on future adventures? "I love the characters and I think there are plenty of adventures that they could go on. I just hope that people love them as much as I do. If people out there really enjoy this movie, then absolutely, there’s no reason they couldn’t come back." Missing Link is in cinemas on April 5, rating PG.